Horse lovers have long had a special affection for the fox. This may be due to the long history of fox hunting, where rider and horse pair with baying bands of hounds to chase the elusive red-tailed creature over hill and dale. More often than not, the fox slips away…and perhaps there lies the root of our affection. Foxes are wily and elusive, not easily caught. Foxes are known to be tricksters. They survive by outwitting and eluding their prey. Where a wolf might survive on brute strength alone, and dogs depend on their friends and human companions, a fox uses wit, wisdom, and the ability to lie low to make their way in this world. 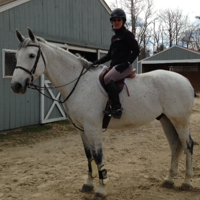 Many horse jewelry collectors appreciate fine fox jewelry. 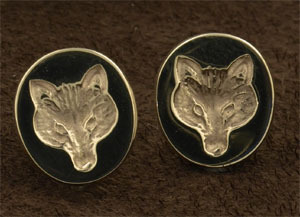 You can find beautiful fox earrings, such as these signet earrings pictured above. Slightly less than half an inch across, these oval shaped earrings flatter many face shapes. The gold fox head is striking and dramatic against a black background. These earrings can be worn with formal and casual outfits – can you imagine how sharp they’d look with your show ring outfit? If you’re looking for fox earrings, be aware that one trend is to have fox earrings with jeweled eyes. You can find foxes that have ruby eyes or sapphire eyes, for example, and both styles are extremely striking and distinctive, adding just enough sparkle. Fox pins are extremely popular. Right now, we’re lucky to have a nice collection of sterling silver fox pins available. Foxes sitting, sleeping, running, or even dancing are all beautiful options. Fox jewelry makes a great gift, for yourself or for a friend. In Japan, the fox symbolizes both longevity and protection from evil – a great gift for someone you want to keep around for a very long time! Native Americans considered the fox a messenger – but whether the news was good or bad was often uncertain!